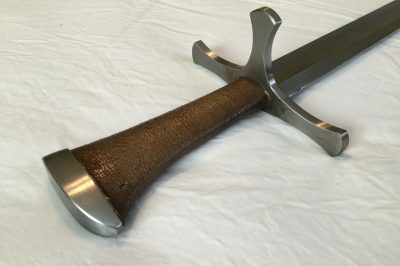 The Chlebowski Langes Messer are the full-contact, HEMA quality langes messer by Chlebowski Swords. Made with the same top-tier quality of all Chlebowski swords, these langes messer have quickly become a go-to design for those wanting an agile yet durable training tool. These langes messer come with the signature Chlebowski flush finished peen on the pommel and hollow ground blade as well as a brown cord wrapped grip. Rest assured your cross will remain firm and strong as a result of the unique double-peened blade attachment to the cross, a Chlebowski innovation designed to bring longer life to your Chlebowski Langes Messer. Custom options are available by special order.